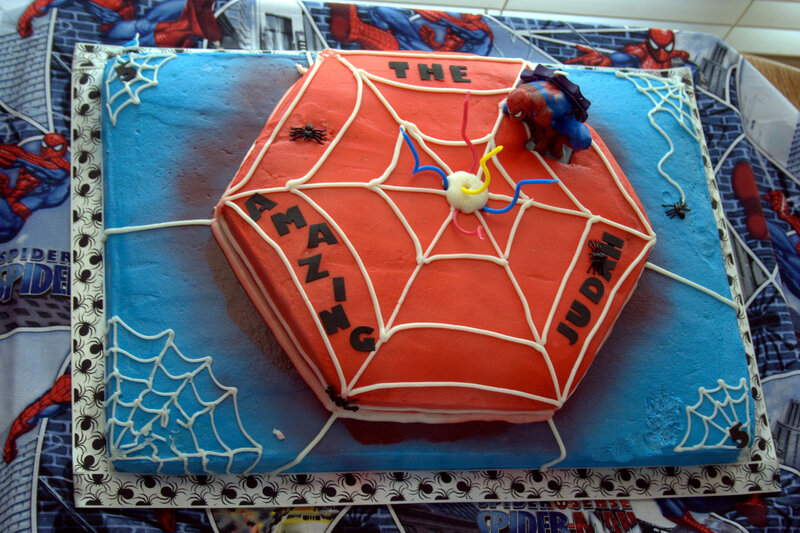 Our Amazing Judah turned 5 this year and we just had to celebrate Spidey style. 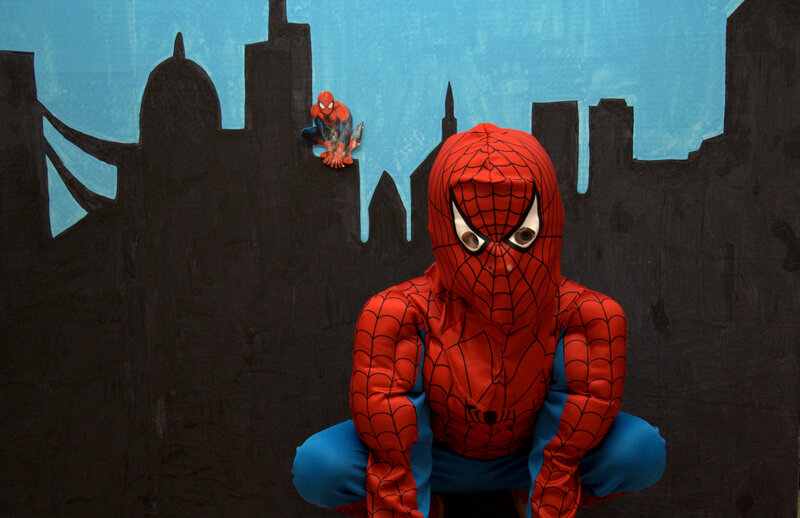 Judah has been in love with Spiderman since some time around last summer-fall, but not because he had seen any of the movies or comics or cartoons; Judah fell in love with Spiderman when he saw a costume in the store. 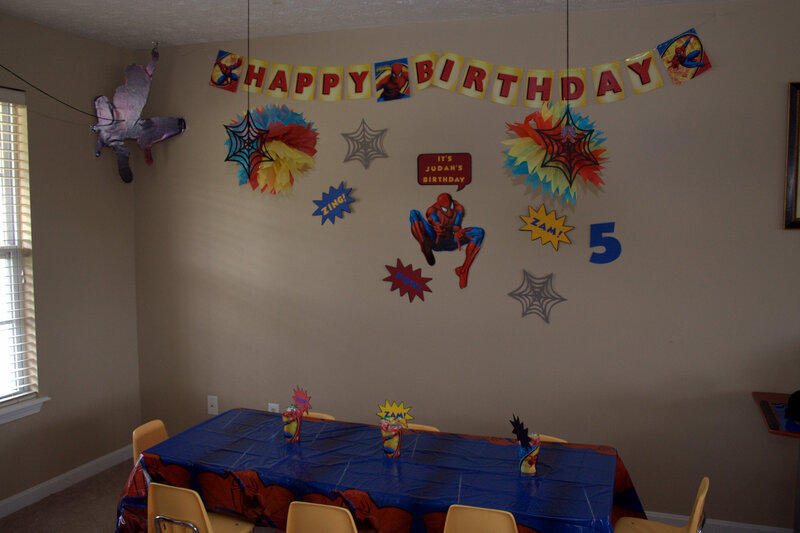 So for 9 months, he had been asking for a Spiderman birthday party. 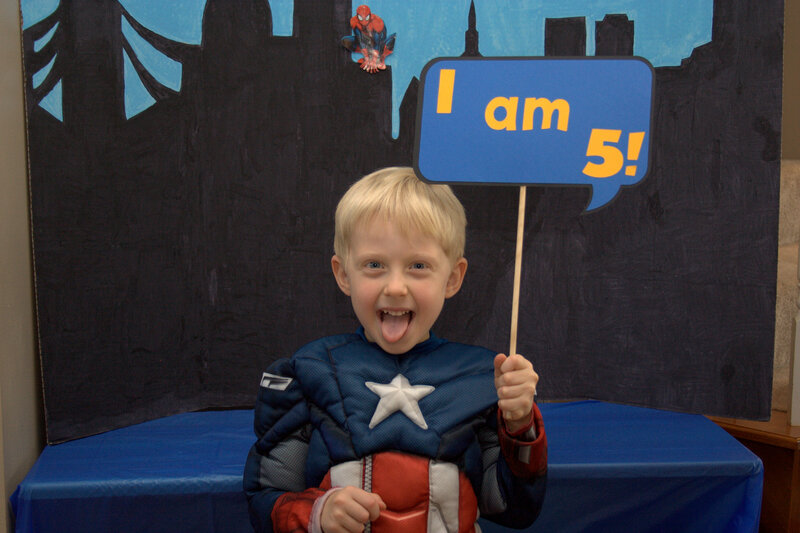 Now that he’s 5, and has a much stronger opinion about everything, I wanted to throw Judah a “super cool” party – one that he would say was cool. 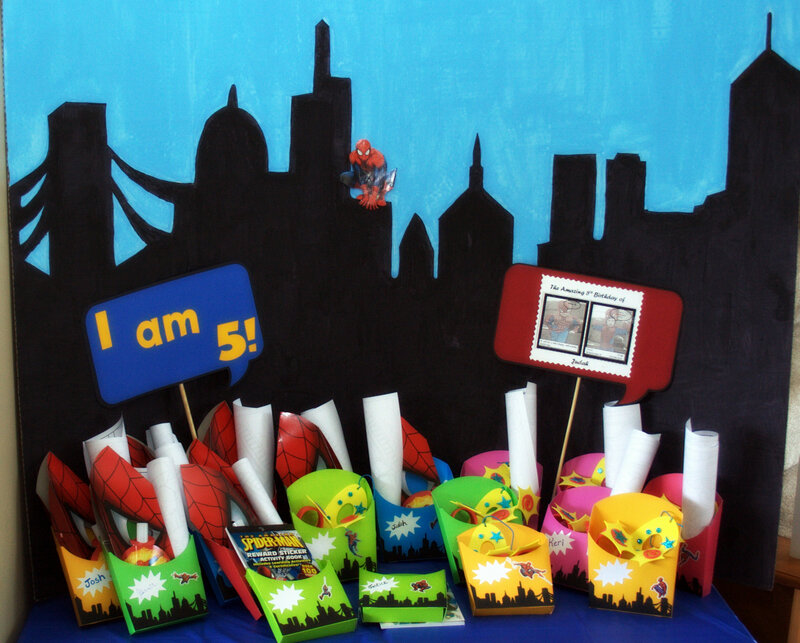 In May we gave Justice an Elmo party that involved turning our entire dining room into Elmo’s World using butcher paper and crayons. 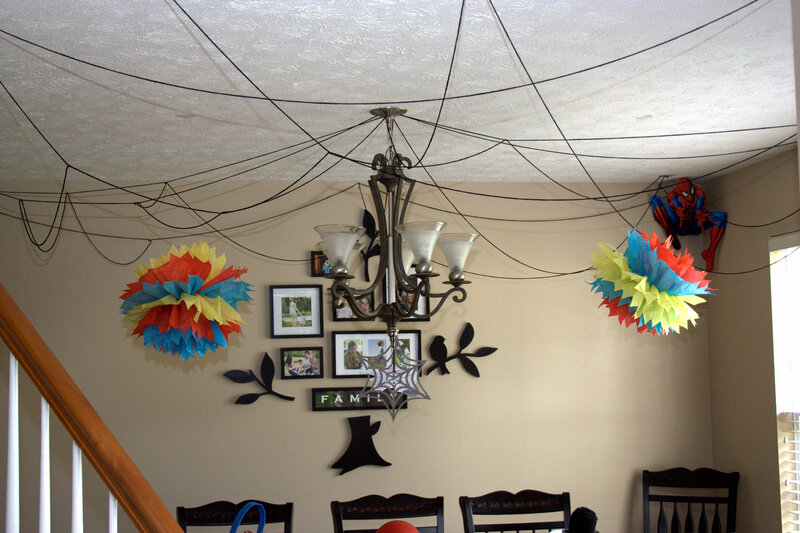 It was a huge hit with the kids, so I wanted to do something just as big and special for Judah’s party. 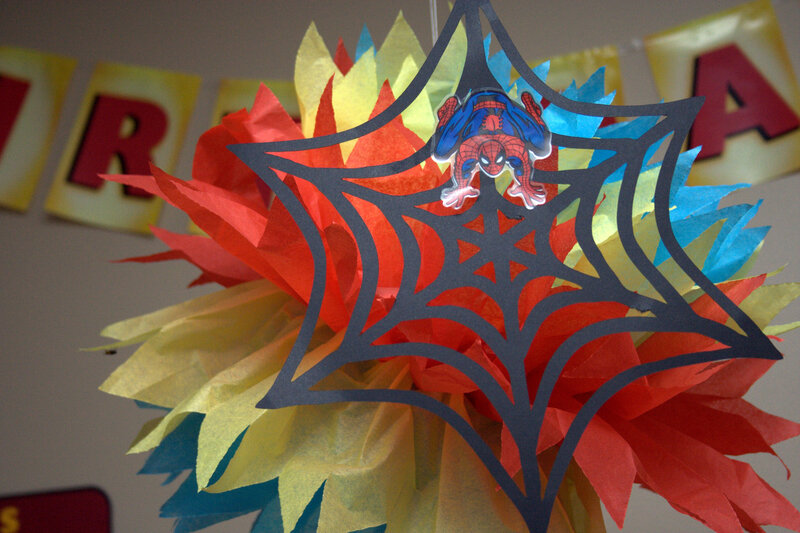 For the invitations I got this idea from a blog I found. 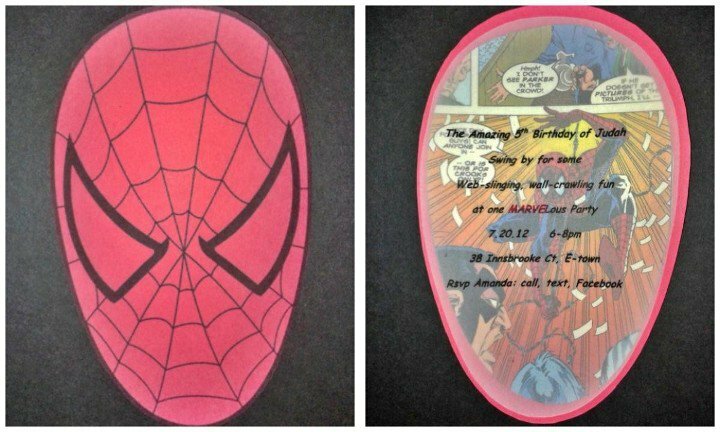 I printed a free online coloring page of spiderman’s head on red cardstock and cut it out. 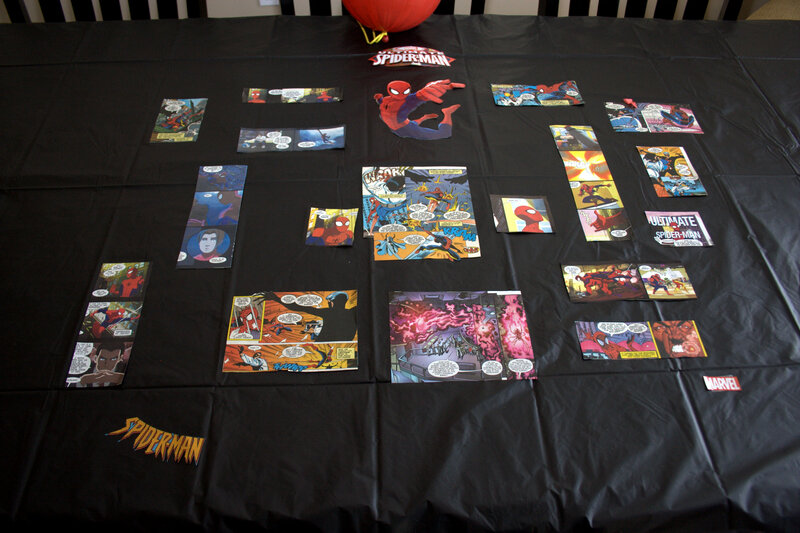 Then I cut a slightly smaller shape from spiderman comic books and glued on the back side. I got some used, inexpensive comics from a local comic store for this. 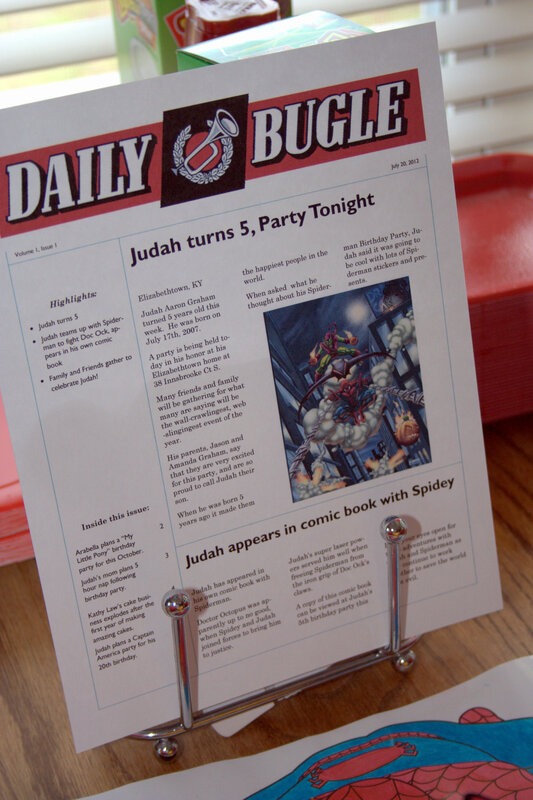 Then I printed the party info on vellum and stuck on top of the comics. 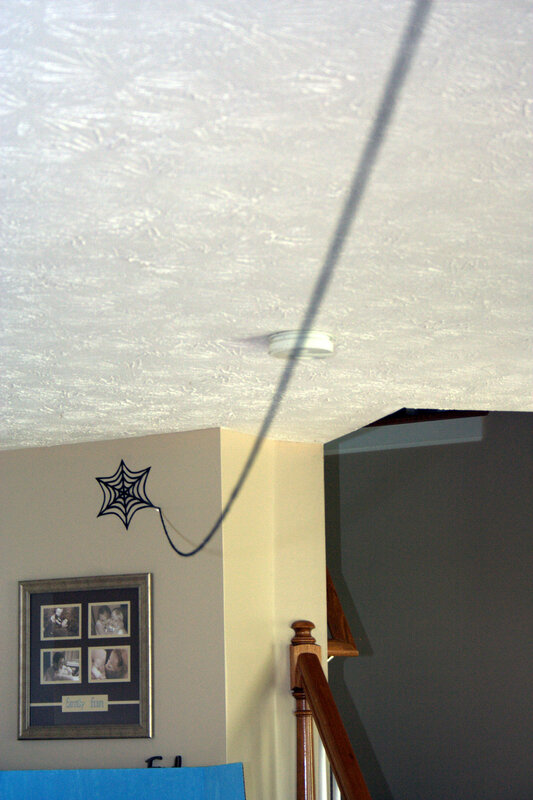 I had to use special vellum tape = $6. 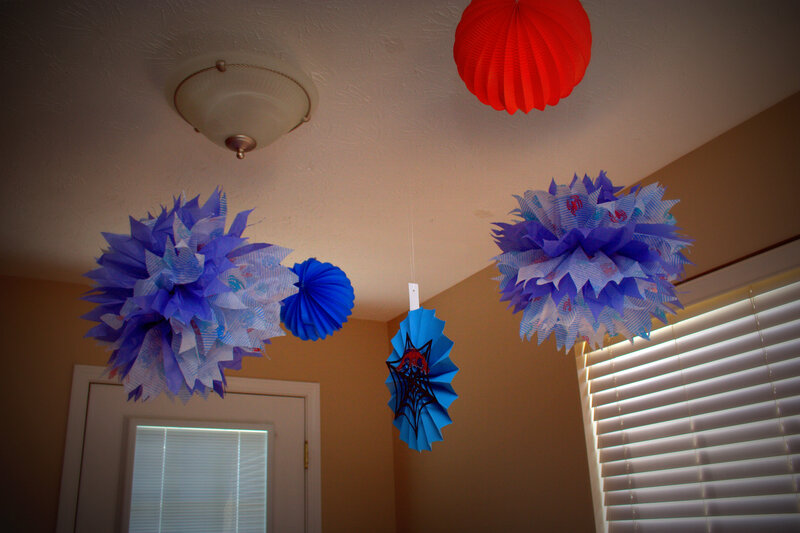 As far as other decorations go, I made pom-poms out of tissue paper, as well as bought a couple of lanterns. 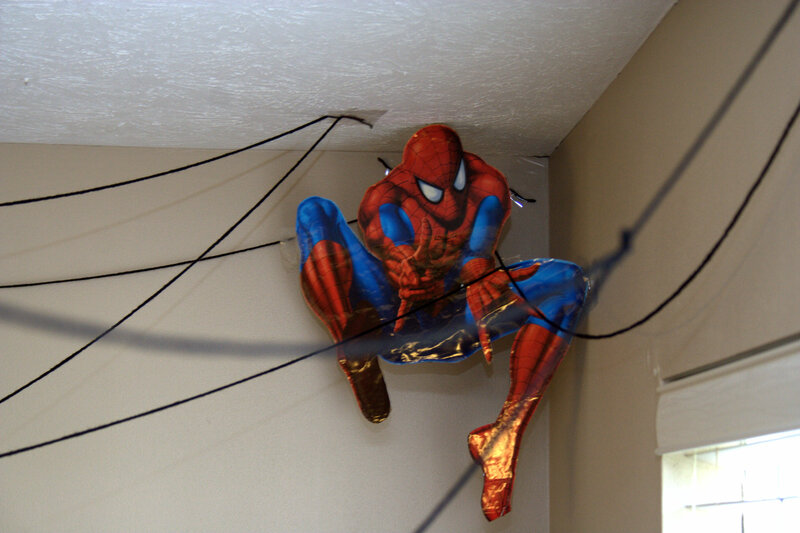 My mother-in-law made webs and call-out sign with her Cricut. 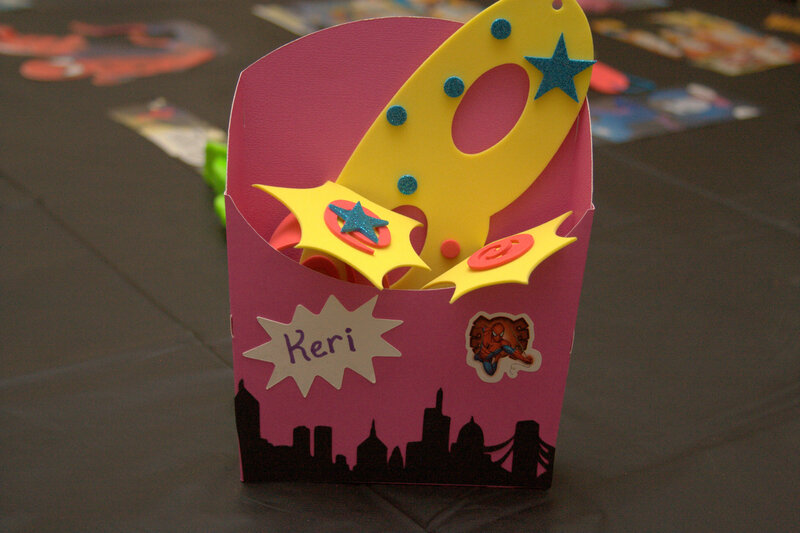 She also had a cartridge that made cityscapes that I used. 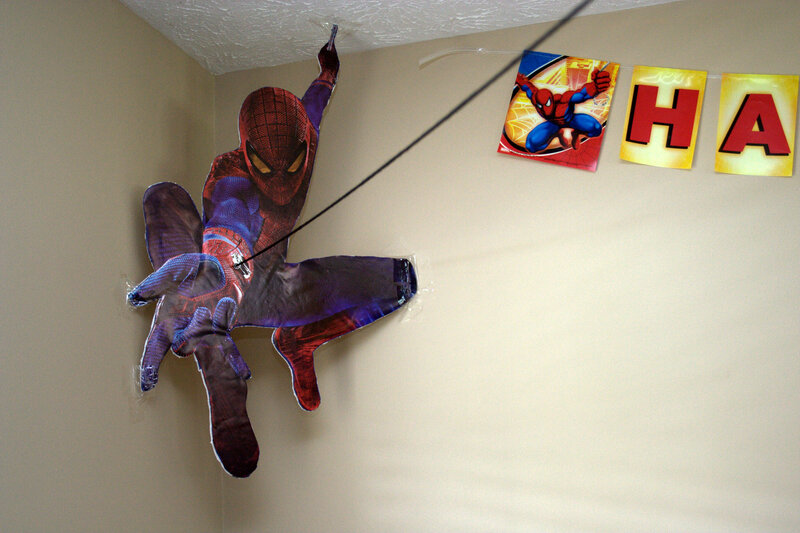 And I did buy a banner and spiderman cups (they held candy) that was on clearance at our local party store. I also incorporated a large cityscape painted on a poster board. I just used a small cityscape that was cut out with the Cricut, and a projector, and traced and painted. 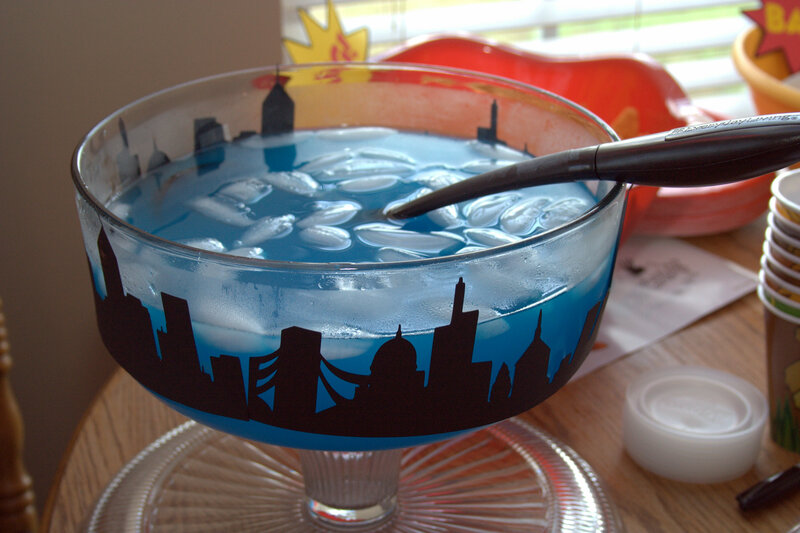 I put the large cityscape on the party favor table. 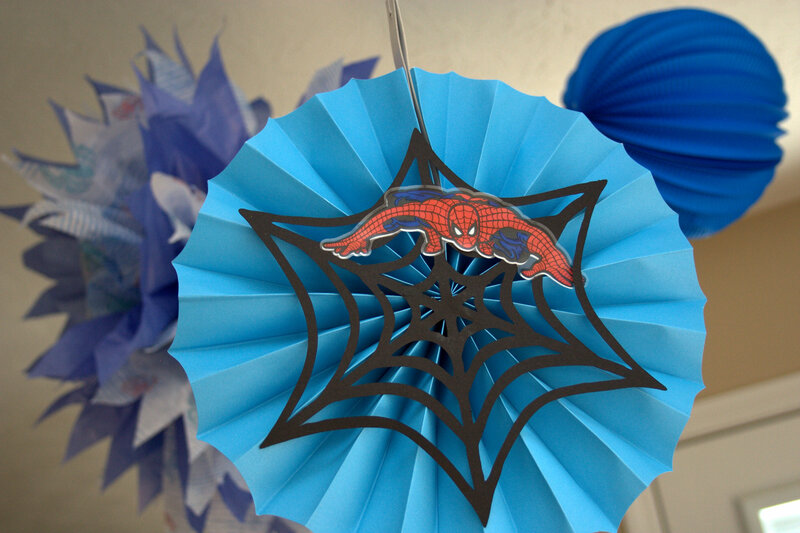 As far as party favors, I try to keep them simple and not spend too much money on them because, as a mom of 3 little kids, I know where they end up…lost or in the trash. So, I got the idea to make these fry boxes from a blog I found, also made with the Cricut, so all we had to do was fold and glue them. I decorated them with a tiny cityscape, a call-out, and a sticker. 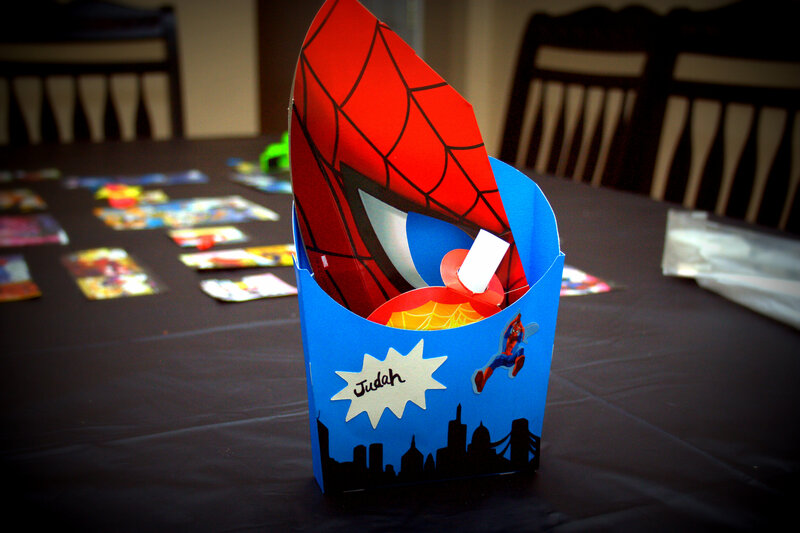 I made the boy and girl boxes a little different, but that was mostly because I could only find 1 pack of spiderman masks. So I gave those to the boys, and made girl masks from a foam kit I found at Walmart. 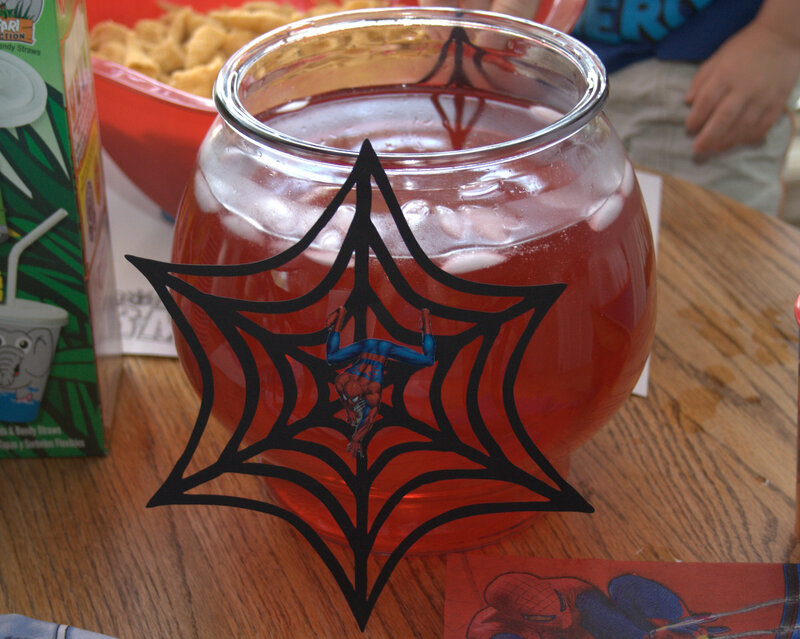 Then I threw in some spidey tattoos, spiderman pinata candy, and a spiderman coloring page. 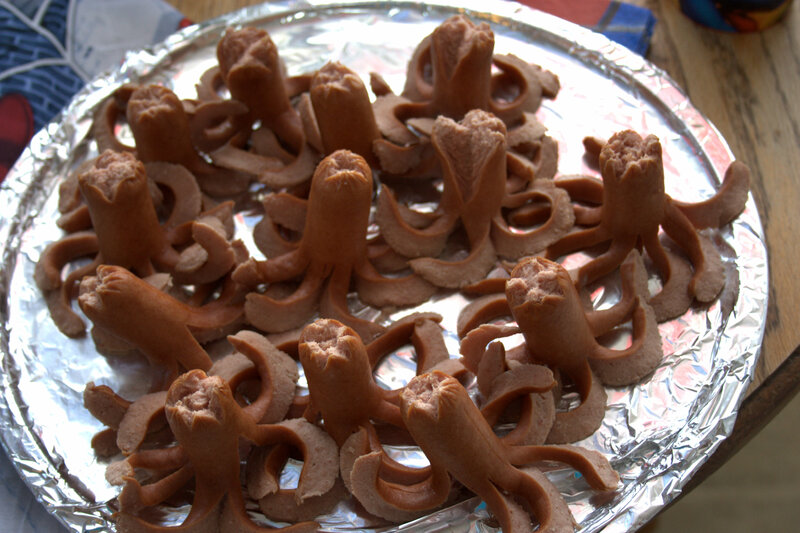 For food we had Doc Ock hot dogs, with chili to go along with it. 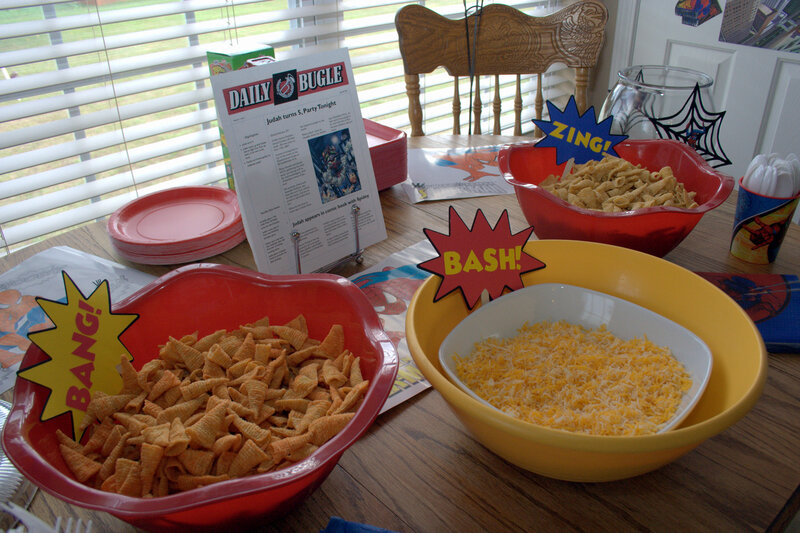 Bugles in honor of the Daily Bugle, the newspaper that Peter Parker photographs for. My husband made our own copy of the newspaper for this special occasion. As far as the cake goes, I just have to say I have an amazing cake lady. She gets all the credit for her work. All in all, everything turned out very nice. I think all the kids had fun, and Judah was very happy with everything. 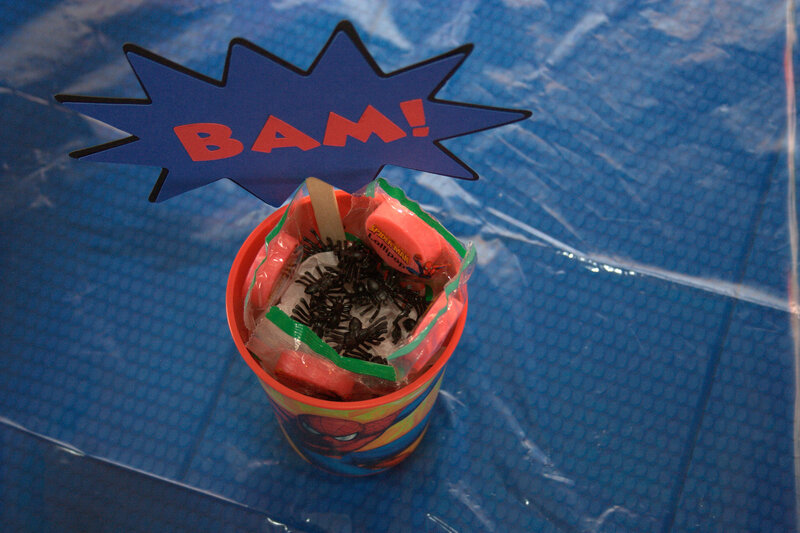 All the hard work paid off with another successful party.